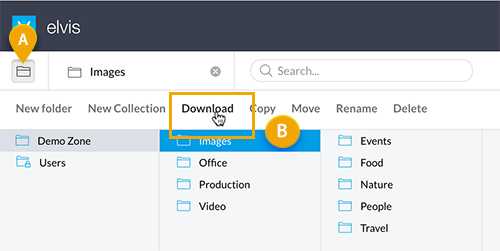 In Elvis Pro it is possible to download a range of selected files or download a complete folder structure. When downloading multiple files, they are combined into a single ZIP file This error can occur when extracting files that are larger than 4GB on MacOS using the default Archive Utility. Please use another application for extracting the files such as The Unarchiver. Original file. This downloads an exact copy of the file. Download preset. (Requires Elvis 5.8 or higher) The system administrator can create presets (through the Desktop client via Organize > Organize Download Presets) containing often used download settings (as opposed to you having to choose these settings manually each time, see Custom Download below). Download Presets make downloading files on a regular basis using the same download settings much more efficient. Simply click an available preset to download an image in those settings. Custom Download. 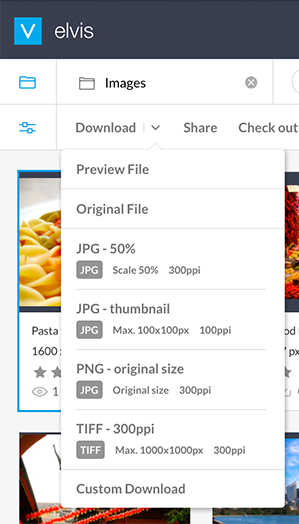 (Requires Elvis 5.8 or higher) Use this option to download an image in a particular combination of format, dimension, resolution and quality1. 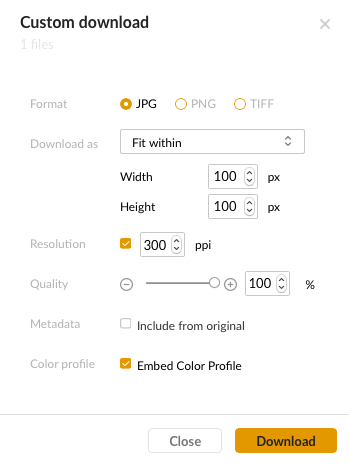 It is also possible to specify if the metadata2of the original file or the color profile that was used to generate the preview3 needs to be included. 1 Requires Elvis 5.23 or higher. 2 Requires Elvis 5.18 or higher. 3 Requires Elvis 5.24 or higher. 4 July 2018: Updated section 'Downloading files' by adding a troubleshooting step for Error 1.